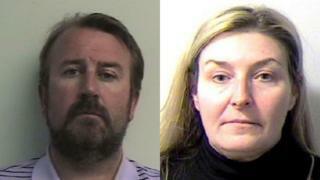 A husband and wife have been found guilty of fraud after the longest trial in UK criminal history. Edwin McLaren, from Quarriers Village in Renfrewshire, was found guilty of property fraud totalling about £1.6m. The 52-year-old, who was said to be the "brains behind the scheme", was convicted of 29 charges and his wife Lorraine of two. The trial at the High Court in Glasgow began in September 2015 and heard evidence for 320 days. It is thought to have cost about £7.5m, with more than £2.4m in legal aid paid for defence lawyers. A spokesperson for the Scottish Legal Aid Board said the amount of evidence in the case meant that it took Crown prosecutors more than a year to present their case to the court, which is "unprecedented". Over the course of the past 20 months, the jury has reduced from the original 15 for a Scottish criminal trial to 12, the lowest number it can operate on. During the trial the court had to halt for three weeks after one juror got married, while others were off sick or took holidays. It is also the first time in Scotland that evidence was led from the house of a witness who was too ill to attend court. The house was set up as a court with all the legal trappings needed for her to give evidence. In an unusual step, judge Lord Stewart used a computer slideshow presentation to sum up the case for the jury. The judge officially retired from the bench on his 70th birthday in December 2016 but was able to continue hearing the case under the provisions of the Judicial Pensions and Retirement Act 1993. Should there be juries in fraud cases? Lord Stewart deferred sentence on the McLarens until next month for background reports. Edwin McLaren was remanded in custody after he was found guilty of 29 charges. His wife Lorraine, 52, was convicted of being involved in the scam to the extent of £128,000 and one charge of mortgage fraud. Her 75-year-old uncle Arthur Horsey was found not guilty of any involvement in the scam. 2005 - London Underground Jubilee Line case - Another fraud case. It took place over a slightly longer period than the Glasgow case but only heard about half as many days of evidence before it collapsed. Six men were accused of conspiring to corrupt public officials and gain insider information on a £2bn extension to the underground. The trial, costing £60m and lasting 21 months, collapsed at London's Old Bailey after a juror "went on strike" claiming loss of earnings threatened his ability to pay Oxford university fees for a course he was due to start. It had already lost two jurors when one became pregnant and another was arrested for benefit fraud. The case led to calls for serious and complex fraud trials to be held without a jury. 1992: The Appeal Court described the marathon Blue Arrow fraud trial, which cost the taxpayer £40m, as a "costly disaster" which must never be repeated. The year-long trial at a purpose-built court off Chancery Lane, resulted in the conviction of four high profile bankers - but the prosecution's joy turned out to be short-lived. The convictions were overturned a few months later when the Appeal Court ruled that due to the length of the trial and the complexity of the subject matter the jury could not have reached a fair verdict. 1996: The trial of brothers Ian and Kevin Maxwell in 1996 was another key case that prompted proposals to change how fraud cases are tried. The sons of late tycoon Robert Maxwell were found not guilty of fraud charges after a trial which lasted eight months and cost taxpayers more than £25m. The jurors in the case spent 11 nights in a hotel before reaching their verdict. What did Edwin McLaren do? The frauds came to light when a woman in Fife claimed she had not been paid the full amount that she was promised for the sale of her house in Cowdenbeath. During a two-year police inquiry, 48 properties were investigated under a property fraud scheme where the owner's title deeds were transferred without their knowledge. Twenty-nine cases made it on to the indictment in court, involving properties throughout Scotland. The frauds were said to have taken place between April 2008 and November 2012. The case was described by police "one of the largest, most complicated property fraud investigations ever carried out in Scotland". More than 200 officers were involved in piecing together the crimes which involved mortgage fraud, property fraud and money laundering. The operation was run by Edwin McLaren who targeted people under financial pressure, often after placing adverts in newspapers for two companies - Property Solutions and Homesale Solutions. McLaren, who would often use a false name, would tell his victims he would sort out their financial difficulties, usually in the form of a loan or leaseback agreement. They thought they were releasing equity from their homes but McLaren had them sign paperwork which transferred full ownership of their property. Police said his clients were usually completely unaware they had signed away their houses until they were approached by officers. The property was never transferred to him - instead he used family members and friends. He also raised mortgages against the properties. Some witnesses said they were not only in financial difficulty but also unwell or bereaved. In the case of one couple McLaren turned up at the Beatson Cancer Centre in Glasgow to get a document signed. The homeowner said he was so weakened by his cancer treatment he did not even know what the document was. It turned out that he and his wife were signing over their house. However, one witness said he had thought McLaren was the best thing that had happened to him. But all along McLaren was using false names and deceiving them. Lorraine McLaren said it was her husband who ran that side of their property business and that she signed the documents when he asked her to. No lawyers who were involved in the transactions were prosecuted as they were used as witnesses in the trial. The 52-year-old lived an extravagant lifestyle in the upmarket enclave of Quarriers Village. He would holiday in Dubai and had a yellow Bentley. His house was worth more than £700,000. McLaren had worked as a financial adviser and had the background knowledge to put the scheme together. His assets have been restrained under the proceeds of crime act. He was said to have shown no sign of remorse. He claimed that he was helping people who had nowhere else to turn and has been quoted as saying he was their friend and saviour.